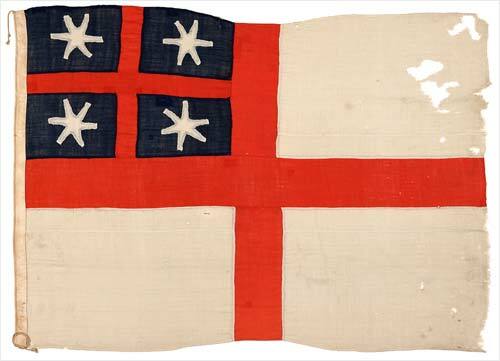 This flag was made on board the New Zealand Company ship the Tory during its voyage to New Zealand. It was based on the flag of the United Tribes, which was adopted as a national flag for New Zealand in 1834 at Waitangi. This flag was raised at Petone on 30 September 1839, with William Wakefield of the New Zealand Company referring to it as the ‘colours of New Zealand’. Following the signing of the Treaty of Waitangi in 1840, at which the Union Jack was adopted by the British as New Zealand's national flag, Lieutenant Governor William Hobson sent an armed group to lower the United Tribes' flag on 30 June 1840. The next day the Union Jack was raised.